Remember the picture of the very unsightly bag in my last post? I gave it "non leather project" as title; and when I was writing those words, I had a small aha moment: why don't I double the handles with a strap of leather? I am a leather designer. I was lucky to find a matching color. It turned out rather good. LoveLea made leather straps for thiss bag. As you can see, I haven't found time to sew the painted panels to the bag, I just pinned them on. When I am in a hurry, my sewing machine senses my mood and won't sew well. I prefer to wait till later. Do you have similar or other project? Tell me in the comments below, I would love to hear from you. Before going to bed/sleep, we make a tour in the garden, mainly to control if the dog has come home. We give food and shelter to a stray dog; her fur is mostly white with black, coal like eyes; she's just adorable and sweet and peace loving, loves to be pet and stroked and cuddled. When it is windy and there is a lot of rustle from the platan she stays outside, is afraid of the noise, she won't even come inside to eat. She has a metal bowl I tap to the granite stones, this sound tells her dinner is being served. We didn't raise her and learned her to eat meat and veggies; she has her own taste and is picky: bread with chicken broth and a piece of chicken or boiled bones and bread; sometimes I give her dark bread, left over from the bread we eat, but she won't eat it, just sifts it out. I wanted to make her a nice leather collar, but just the sight of a collar makes her run away, there must be an old issue with collars. If she wears a collar, people know she is not a stray dog. Our dog resting with coal black eyes. Since 3 days, the night smells heavily of olive oil; there are a few mills in the neighborhood and the pressing of the oil must have started. Funny, it only smells at night and not during the day since the press works continuously. I love the color and taste of freshly pressed olives: gold with a green shine and tasting like fruit juice, not oily at all. Take some fresh cheese, crush it in the olive oil, add some black pepper and wild thyme, maybe a little salt and eat it outside on toasted bread, delicious!!! This is harvest time and there is a lot to do in the garden, even if it is a small garden. This means I don't have the opportunity to make my leather jewels; I'll show you the one I made this week. Lately I'v been busy husking walnuts. It s a time consuming job because the nuts are small and very very hard; a nutcracker is of no use, 2 stones do the job, a big one with an indentation as anvil and a smaller one as hammer. The local stone is granite thus I have the luxury to crush my walnuts with granite. (Can you imagine a village where for the ground floor of the houses granite has been used?) Second inconvenience: there are lots of rotten ones or they have WORMS! This to the delight of a very cheeky, bold jay. He looks you in the eye and continues to do what he intended to do. Still it was difficult to take a picture. We don't want to use chemicals or harsh stuff so we put up with 1/3 of bad nuts. But last week somebody said the three might have worms around the roots and this could be true because we keep a compost heap right beside the tree. We should make our compost on another spot next year. Why do I go through all this trouble? Because they taste so good, very delicious with a deep, intense, well nutty taste. The jay only comes around when there are walnuts shells laying around. Time to tell you about my creations: I had 2 closures with skulls, one I used some time ago for a choker with dark brown leather and I was ready for another one; my leather supplier had a long piece of white leather, nice and thick and stocky. My supplier asked me: will you be able to use it, because it was very sturdy. I said: I will sew it by hand. Oh my, he was right: it took me a lot of time and power to punch the holes for the sewing; once the wholes punched, the sewing with black linen thread went smooth and easy; I like the result, how about you?. A couple days ago, the weather was awful, strong winds, threatening rain, high humidity, bad for health but good for spectacular pictures. If you liked my choker, I have similar ones on my LoveLea fb page. The link is in the left column. Why don't you sign in with your email address, so you get my new post in your mail; and in my next post I'll be revealing a awesome story. Wait and you shall read. Haha, het is altijd interessant om lezen! Op je eerste foto dacht ik dat de vogel een Vlaamse Gaai was, maar op de tweede foto ziet die vogel er uit als een duif. Gaat het om 2 verschillende vogels of is het telkens dezelfde vogel? Je shoker vind ik wel mooi, met dat witte leer. Marcel maakte vandaag een nieuwe sleutelhouder in leer. Je weet wel, een die er uit ziet als een klok met een klepel. 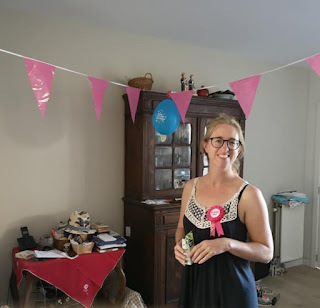 Aan de klepel hangen de sleutels en bovenaan trek je aan de klepel en zo komen de sleutels in het hoesje( de klok) en dan kan je de klepel vast leggen zodat de sleutels niet terug uit het hoesje zakken. Allez, tot een volgende keer! de choker vind ik ook mooi, goed contrast met de doodskoppen die net niet pikzwart zijn. die sleutelhouder heeft idd een slim systeem; naait hij zijn klol of plakt hij het? en fantastisch dat je elke week bloemen uit je tuin in een vaas kan zetten! waw. tot volgende week.